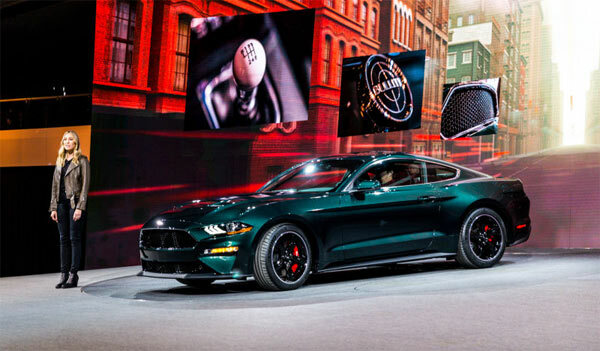 Dealers are now accepting preorders for the 2019 Ford Mustang Bullitt at $47,495 with a $900 destination charge. This is $7,405 on top of a Mustang GT Premium, but you do get more for your dollars. Along with the movie association, you get a 5.0-liter V8 with around 460 to 480HP, 420 lb-ft. of torque and a reported top speed of 163 mph. other nice features come in the form of the intake manifold from the Shelby GT350, 87-millimeter throttle body, ECU upgrades, performance open air intake, black-tipped quad exhaust as used on the Mustang GT’s active exhaust, red caliper Brembo brakes and a 12-inch digital instrument cluster. Colors come in the form of Shadow Black and the iconic Dark Highland Green. The interior will be leather with green stitching with Recaro seats, chrome accents on the grill and windows. An electronics package includes navigation, upgraded stereo, blindspot monitoring and memory function. Its a Bullitt but also has all the lovely features of the Mustang GT in one package.